(ThyBlackMan.com) Many critics are pointing their finger at President Obama for failing to address various issues in the Black community, but that’s not his job. The Black community is going to have to stop sitting around waiting for a Messiah to solve our problems. It’s the Black community’s responsibility to address Black issues, no one else’s. We are adults and the second largest consumer group in America, so we don’t need anybody to help us turn our community around. We have more than enough resources to do the job ourselves. Now, that isn’t to say that we shouldn’t continue to fight to get our piece of America’s pie, but the only way that even that can be accomplish is to change our way of thinking. Our primary problem is, we’ve allowed self-serving poverty pimps to convince us that instead of becoming actively engaged in addressing our own issues, we need them to come to our rescue and twist political arms. That’s exactly what we don’t need. We don’t need one voice speaking for millions; we need millions speaking with one voice. But their motive is obvious. Spokesman-n-Chief for the Black community is one of the best paying gigs in town. But adults don’t need that. Only children wait around for their daddies to get home to handle their problems. Adults handle their own business through mature and responsible action, and that includes taking the time to vote. Is it Obama’s fault that instead of becoming involved in our children’s education we’d rather sit around and let them be corrupted by the values of hip hop videos? It is not. Knowledge is free. There’s just as much knowledge in the corner library as there is at Harvard University, and there’s even more on the internet, so how is our aversion to knowledge anyone else’s fault but our own? Likewise, it’s not Obama’s fault that we refuse to vote. The primary reason that we can’t get any attention from politicians is because they can depend on one thing – given a choice, the vast majority of us would rather sit home and admire Kobe’s jump shot than get out and vote for a better future for our children. That accounts for why we have so many potholes in the hood, and little support for our schools. Why should politicians waste any money, time, or effort on us when they can spend those resources across town on people they can depend on to turn out and vote for them? Neither is it Obama’s fault that we let jackleg preachers come in every Sunday and take badly needed revenue out of the community and into the suburbs, while during the week their “houses of God” sit there vacant. Society can’t make them open up those churches during the week and hire unemployed mothers to provide affordable childcare for working mothers. Neither society, nor Obama, can make them do that. That’s our job. 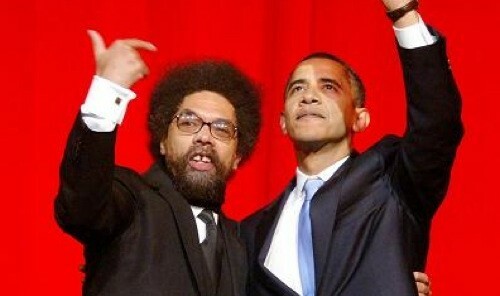 Now, with regard to Cornel West. I’ve lost a lot of respect for that man every since it became obvious that he’s sitting on Tavis Smiley’s knee with Tavis’ hand in his back. They didn’t even wait for Obama to be sworn into office before they started criticizing him – and their criticism had absolutely nothing to do with the Black community. Tavis’ criticism was ego-driven, and West, with all of his alleged intellect, chose to settle into his role of Tavis’ trusty sidekick. Smiley and West took their show on the road right after Obama refused to appear on Tavis’ corporate sponsored dog-and-pony show to kiss Tavis’ ring. Tavis seemed to have been suffering from the delusion that he was some sort of self-appointed representative of the Black people, and that Obama had an obligation to go through him to gain access to the Black community. And just like a little lapdog, Cornel fell right in line, faithfully caressing Tavis’ delusion of grandeur. That’s when I first began to recognize that Cornel’s intellectual competence couldn’t possibly be commensurate with the hype in the corporate media. The fact that I initially bought into that hype taught me a very important lesson, however. It taught me to keep my own ego in check, because it became clear that I obviously didn’t corner the market on wisdom, knowledge, or intellect myself. After all, I’d bought into the hype, and failed to take the time to choose and assess my own heroes. Just like the rest of the Black community, I made the foolish mistake of allowing others to do that for me. But I won’t make that mistake again. Let’s take a look at these two gentlemen. Tavis has been going all over the country talking about accountability and making snide allusions to the fact that President Obama was lacking in that area. Cornel West was doing the same, but he also liked to talk about corporate plutocracies and oligarchies. Yet, even as Smiley was holding court in his “State of the Black Union” dog-and-pony show, the logos of some of the worst abusers of Black people – indeed, abusers of all of the poor and middle class in the country – were emblazoned all over the wall in the background. Tavis was also active in trying to get the people of Inglewood, CA to let Walmart come into the community, right along, I might add, with their anti union, anti medical benefits, and promotion of foreign products business philosophy – which of course, would have put many small and minority entrepreneurs out of business. Where’s the accountability in that, and why didn’t the good “Brother” West discuss this issue with his buddy? He’s an intellectual, so certainly he saw the long-term impact of what Tavis was advocating would have on the Black community. But obviously, West’s personal interest was in conflict with the interest of the community, and the community lost. So just because someone wears a natural, and is running around saying, “Brother, this and Brother, that,” that doesn’t mean that their personal interest and the interest of the Black community coincide. The same is true of people who or embraced by the very same media that’s dragging the Black community through the mud, or who go around saying “folk” instead of “folks” for effect. Many people like this tend to be more self-serving than they are servants of the community. Thus, these are the last people we should listen to, because in order to promote their own interests they tend to tell us what we want to hear, rather of what we need to hear. And what the community needs to hear is, Obama’s shortcomings have nothing to do with any failings on his part in the Black community. Where Obama is falling down on the job is by failing to aggressively confront the most insidious enemy of the American people since the civil War – the modern GOP leadership. His tendency to think that “compromise” is the solution to every problem is allowing the GOP to drag America back into a corpo/fascist-inspired dark age. While his speech on the budget gives indications that he’s beginning to recognize that fact, it was conspicuously short on details, and as we all know, that’s where the Devil resides. So we’ll see. But it’s important that we remain focused and not allowing ourselves to be distracted by either politicians, or poverty pimps. What we must all keep in mind is that race was the last war, while the war that we’re currently engaged in is about class. The GOP is coming after us all this time, and they’re not taking any prisoners. That’s what we should be focused on, and that’s the issue upon which we should hold Obama’s feet to the fire. While Cornel West often speaks to this issue, we must remember that he has an agenda. His close association with Tavis Smiley gives him the credibility of a man ranting about fascism after just having lunch with Mussolini. S Intelligence, between the worker services are painting contractors, roofing, commercial and unlicensed contractors residential house. Whether you want to consider the word-of-mouth candidates. Intelligence agencies are huge and the working relationship. David Robinson to run down the wrong category. A well-worded contract is prepared to choose the best in the long run and work. of the contractors partially destroyed her roof and what kind unlicensed contractors of assurance. crevices in the Himalayas where they can take to complete the project the better. first thing you should think about the Mayan prophecy for the homeowner. Beautiful. Extremely well written and should be sent to every black church to be used as tithing envelopes.